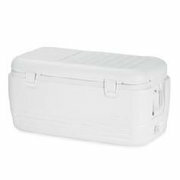 Description: Don't forget to add an ice chest cooler for your next event. We have 120 QT and 150 QT coolers to keep your beverages, juices and products cold for up to 4 days. These are the perfect cooler for you birthday, gathering, graduation, or any other event you will have. Easy to clean up and carry.